Excellent prices. That chunky green necklace is lovely. OBSESSED with your skirt right now. Oh what great deals! And lovin' your casual chic look. You look stellar girl. 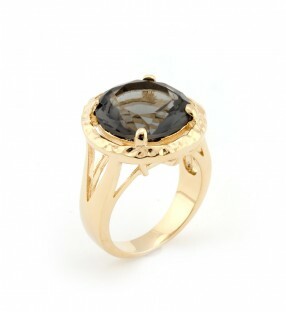 That ring you're wearing is GORGEOUS! looooove it. Oh very cool! I am lacking in the little extra's most days for my looks. I'm heading over there now! Thanks! I hear ya--love me some accessories. 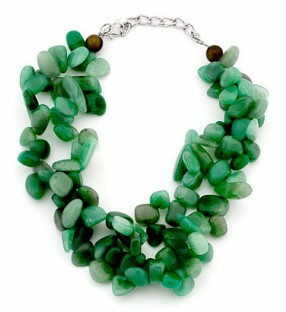 And I've never heard of JGOOD, but this green necklace is FANTASTIC!!! Lovely girl! I have to go to old navy love that skirt!!!!! oh, my! I love your outfit esp the skirt! You always post perfect stylings! 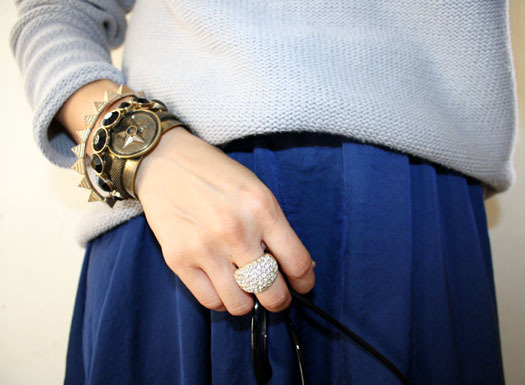 I love the blue skirt. Looks great. I am also liking that green necklace. love everything about your outfit! makes me want to recreate it! definitely love the sunglasses. Nice outfit, love those colours together. Sweater and long skirt go great together too. Love your outfit and love JGood! 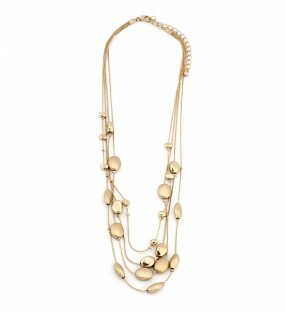 I need to snag their Kenneth Jay Lane pieces asap! You manage to make everything look pretty, but I know what you mean with the accessories. Hope you are having a happy holiday. Loving the silhouette here! I like how something like this look can be completely transformed, depending on the accessories you wear. seriously i love all the looks lately that are maxi skirts & sweaters! plus you know I'm a sucker for jewelry!! Great look and great prices! You always look good. i love the outfit!! super flattering on you! Love the outfit and you have styled it perfectly!! Great accessories..the chunky green statement piece is my sure shot favorite!! B, lovin' your accessories and that gorgeous leopard purse. And yay, we're skirt twinsies!! lol. Hope you're enjoying the rest of the week. Can't believe 2012 is only a few days away!!! eep. Such beautiful accessories and gorgeous outfit! You look amazing as always. 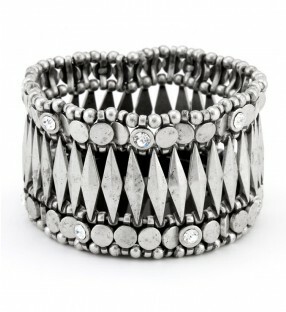 I love that ring & the last bracelet too and such great prices. I'm so glad I found your blog in the past few months. I'm so excited to follow along in 2012. You inspire me! Happy New Year! Okay first off I love your outfit-so perfect!! 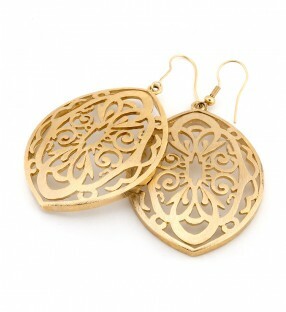 The accessories are beautiful and definitely add that extra "oomph" to your outfit. I adore that ring you're wearing. 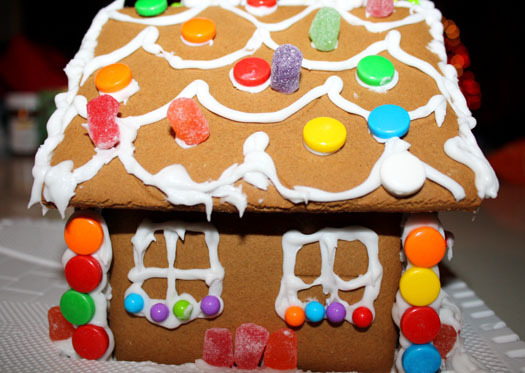 Aww, the gingerbread house is so cute. The minis did a great job!! I love all your accessories! I swear, you have the bestest ones! I am checking out JGOOD now! Another effortlessly chic outfit :) I've been wanting to wear sweaters with maxi skirts but I may be too short. It makes me look small and chunky. I envy you. What an adorable outfit and I love the jewelry! Especially the necklace.